Words and images have been an inseparable part of my life for as long as I can remember. They have always played a pleasant game in my life, complementing each other almost at all time. Their relationship never ceases to amuse me. In fact, my love affair with these two began way before I even became aware of their indispensable presence. When one failed, the other rushed to my succour. Often, when words are inadequate or fail to keep with the pace of my mind, I suddenly inadvertently switch over to lines. And vice versa. A glimpse at my college notebooks is a testimony to this complex process. In fact, nothing better explains this progression than the book, ‘Gateway’ which is one of my humble efforts at vindicating this complex process. I penned down my impressions about people and places in Mumbai and sketched images of the complexities of urban life. I do not recollect what came first- whether sketches or words but then, none of them was meant to precede the other. It had to be a mixed process switching between words and lines to be able to best express myself. Writing, drawing and painting are passions closest to my heart. I am often asked what makes me pick up a brush or a pencil and what makes me draw or paint but it seems like it is the most difficult philosophical question I am faced with. When I stand before an empty canvas, there is an urge, an instinct, to fill up the space. The canvas is no more a piece of paper but a universal void, emptiness, silence. It screams to be pampered, to be filled. And then, when my brush finally marries the canvas, there is complete oneness, advaitva. The end result is the outcome of this complex process. Mindscape is new series of abstract paintings that tries to capture frame of mind when the conscious and the unconscious blends together as during state of trance. Basically it is an experiment to map the mind, searching our own inner world when it is in the trance state - a state where you are not aware of reality nor are you totally unaware. It is a dream-like state with a mix of reality around, with desires, imagination and something beyond reason. There is nothing finite, it is outburst of intense and spontaneous energy. 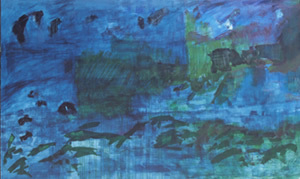 Blue is the colour of spiritual awakening, most of the art work in the series are in different hues of blue. A brain has a physical form, performing tasks on its own to keep a human alive. The Mind is its non-physical component enabling thought, perception, and reasoning, evolves guided by circumstances. Mind can reason as well as emote, and dictate actions just as the brain does. Dreams explain how it can be at play even during sleep. Reality is when we are awake. A dream-like state is a trance. Prakash Bal Joshi’s work on display, THE MINDSCAPE, is his journey into the unfathomable Inner Mind, probing it during moments when neither aware nor unaware of the reality, but positioned in between. In the trance-like state, realities and imagination, the past and the future, the desires and deprivations, all combine to form a visual statement flowing out from the brush. Different hues of blue, a touch of green, seek to provide overlapping visual forms to the indefinable state of The Mind, its complex layers in an exploration that can never conclude.